I realize I’ve missed Christmas by a day with this post, but if you are looking for a great gift for a grandparent, maybe for a birthday or a belated holiday gift then look no further than these two adorable books. 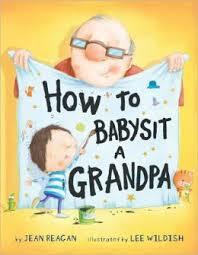 How to Babysit a Grandpa and How to Babysit a Grandma, written by Jean Reagan, illustrated by Lee Wildish, and published by Alfred A. Knopf, are endearing instruction manuals for what kids need to do when babysitting a grandparent. The illustrations really make these stories magical and entertaining, and the books’ layout of categories with accompanying lists such as, “HOW TO ENTERTAIN A GRANDPA: *Somersault across the room *Put on a scary play *Show off your muscles,” make them easy to follow and understand. Kathryn Otoshi just may well end up as my next Author Crush because, she too, is simply brilliant. Who thought of writing a concept book about numbers and colors that deals with such compelling issues as self-esteem and bullying? The answer is Kathryn Otoshi. For my daughter's first birthday, she received Kathryn's book, One. It quickly became and still remains one of our favorite read-alouds at bedtime. Two is just as brilliant, if not more so.